A friend of mine asked me recently if it was possible to trade forex and still keep his full-time job. It is quite natural that people want to keep their job and not to jump into trading head on without any backup. Especially when they are new to trading or if they are still learning how to trade. I was thinking about how to best help him and I came up with a simple plan. The plan I developed is for swing trading because swing trades are much easier to manage and much less time-consuming than for example intraday trades. The trading plan consists of two parts. There is a 10-minute daily routine and there is a few hours block every two weeks which you will need for analysis. Before you start the 10-minute daily trading routine, you need to create trading levels that you are going to trade in the next two weeks. There are three ways to do it. Do a research, develop your own strategy, backtest it and then start trading it. It is a good way (the way I took) but it takes time. Extreme amounts of time, actually. Also, it leads to many dead ends. A person with a full-time job usually doesn’t have that much time to spend. For this reason, the next two options are in my opinion much more time efficient. Learn the trading strategies that I personally trade. You can do it for example by watching my free Volume Profile webinar in which I show you the strategies. You can watch it here: Learn How to Trade Forex Using Volume Profile. If you don’t feel confident enough with creating your own trading levels yet, you can join my trading course where I publish my own trading levels. I also comment on each level and show you exactly the reasoning behind it. In my opinion, this is a very efficient and quick way to learn and it also enables you to trade immediately. I think the sweet spot lies somewhere between the second and third way. I think it is best to learn my trading strategies from the webinar first. Do your own market analysis and afterward go through my analysis and levels which I made for the members of my course. This way you will be able to compare your levels with mine. It will help you progress much faster than if you were doing your analysis alone without any feedback. If you decide to create your own levels then I think that the analysis could take you realistically around 2-3 hours every two weeks. This depends on the number of trading instruments you analyze (I personally do 15 forex pairs). When your analysis is done, you only need to place limit orders for all the trades you are going to take. With all your levels created and limit orders set, the only thing left is a proper trade execution. For this, you want to use the 10-minute daily routine plan. First, I suggest that you figure out which part of the day you will focus on trading. This hugely depends on your daily schedule. The best time for it is around the New York close but it is not a huge deal if this doesn’t suit you and you decide to focus on trading for example 10-minutes every morning, after lunch or in the evening. I only suggest that you do it the same time every day to develop a habit. The 10-minute plan consists of three parts. It is vital to quit all your trades before the macro event and not to open a new trade until the post-news volatility has settled down. What I suggest is that you check the next day’s macroeconomic events (for example on Forex Factory). If there is a “Monster red news” then you quit all your swing trades. It doesn’t matter if this is still many hours before the news. What matters is that you won’t be caught in a bad macro trade while you are at work the next day. You also need to discard your limit orders so no new trade will get triggered during the “Monster red news”. You don’t need to delete all limit orders. This concerns only the ones that are directly affected by the particular macro. So for example, you don’t need to delete limit orders on the AUD/USD when there is ECB rate decision (this macro affects mostly the EUR). 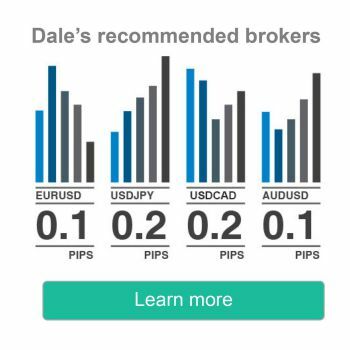 However, if there is, for example, RBA Rate Decision news (this affects the AUD) then you definitely need to delete your limit orders on the AUD/USD and on all trading instruments related to the AUD. TIP: There is a little trick so you don’t have to delete your limit orders and re-enter them again if the news didn’t hit them. The trick is that you lower the volumes of the pending limit orders to a minimum value before the “Monster red news” release. So, even if the level gets hit during the news, you only risk few cents or a dollar. After the news has passed, you only need to raise the volumes again. This is a pretty fast and easy way to avoid the news without having to re-enter all the limit orders again and again. This trick works with cTrader trading platform which I use. There is probably some plugin that will allow you to do the same trick also with Metatrader. Go quickly over all your trades and see if there was any Profit or a Loss. If there was, then you need to write the result and necessary details down into your trading journal. It is also handy to take a screenshot of your trade and add a brief commentary. For taking screenshots I use a free program called Lightshot. As far as Stop-loss management is concerned, I suggest you use the Alternative SL method. With this method, you need to check how the current Daily candle closed every day. If a daily candle closed past your SL, then you need to manually quit your trade. This may look difficult but in fact, it takes only a few moments to check and it is much more effective than the standard fixed Stop-loss method. Create your swing trading levels or use mine. You do this once per two weeks. Go through upcoming macro news and close any limits/running trades if there is a “Monster red news” the next day. Review your current trades and see if there is any trade that needs to be manually closed (daily candle closed past your SL). If any trade reached Profit or a Loss today then take a screenshot and write the details of the trade down into your trading journal. P.S. Below are three videos with some of my swing trades and with the reasoning behind the trades. Those videos should help you understand how to trade swing trades with Volume Profile and show you what to expect from such trades.